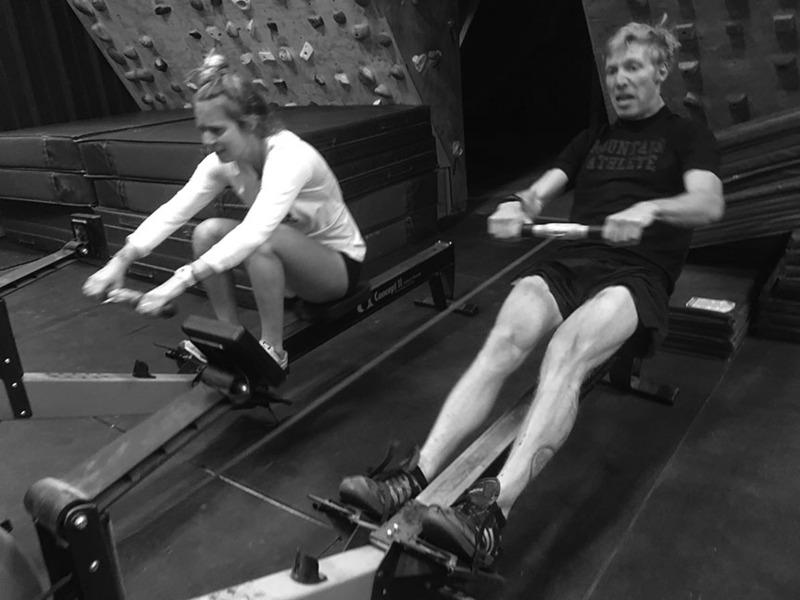 Ally and Sam fight through the 2,000m Row Re-Assessment. We conducted a short, 4-Week Mini-Study to test the cross transferability of two modes of endurance training: Running to Rowing, and Rowing to Running. Results found assessment improvement in both modes, but the transfer of rowing to running was twice as great. Does swimming make you a better runner? Does running make you a better cyclist? Does cycling make you better at hiking uphill? Can I row instead of run and still see running improvement? These are common questions which come up often by athletes who have equipment and/or space limitations and can’t follow our programming as prescribed. Our goal with this Mini-Study was to examine this question using two modes, Rowing and Running. This was a 4-week study. Seven MTI Lat Rats, all veteran, fit, experienced athletes, were split into two groups: Running Group and Rowing Group. Week 1, both groups of Lab Rats completed a 1-mile run assessment, and a 2,000m Row assessment on a rowing erg. Anecdotally based on completion times, we find most athletes finish these two efforts in approximately the same completion time. For the following weeks (2 & 3), the two groups completed separate endurance work on Tuesdays and Thursdays. The Running group ran four 800m repeats at a threshold pace, with a 5-minute rest between efforts. The Rowing group rowed 1000m repeats at a threshold pace, with a 5-minute rest between efforts. Week 4, both groups re-assessed the 1-mile run for time and the 2,000m row for time. Mondays and Wednesdays during this mini-study, both groups completed the same multi-modal programming. (1) Does training in one mode (rowing) improve performance in another mode (running)? If so, how much? (2) Does training in one mode (running) improve performance in another mode (rowing)? If so, how much? (3) Which mode (running or rowing) has the best transfer to the other mode. All the athletes in the study improved their finish times in both re-assessments, the 1-mile run, and 1-mile row. However, what is surprising is the greater improvement by the rowing group – especially in the transfer to running. The Rowing Group improved their 1-mile run time by an average of 5.75%, versus just a 4.9 percent improvement by the Running group. This suggests that rowing is better than running at improving running! However, a closer look at the data identifies two outliers: Bodi and Wyatt. Bodi in the Running Group barely improved his run time despite running all the 800m repeats – just a .5% improvement. Wyatt, from the Rowing Group, improved his 1-mile run time by a staggering 16.2% despite not running at all between assessments! When these two data points are removed, the Running Group improved its run time by an average of 7.15% versus the rowing group which improved it’s run time by 2.26%. This makes more sense and indicates that running improves running performance three times better than rowing. Looking at the 2000m row assessment, the Running Group improved by just 2.86%, versus a 5.1% improvement by the Rowing Group. Again, this makes sense and indicates that rowing improves rowing two times better than running improves rowing. So, the data indicates that running transfers to rowing slightly better than rowing transfers to running. But clearly, if you want to improve run performance, run. Likewise, if you want to improve row performance, row. Yes, but slightly, by 2.26% and three times worse than running alone. Yes, slightly, by 2.86%, and two times worse than rowing alone. Running transfers better to rowing, based on this mini-study, but the because of the few number of athletes, this result is not concrete. From a training and programming perspective, perhaps the more pertinent question is will training in one endurance mode help me in another mode? The answer, based on this limited mini-study, is yes, but not nearly as much as if you had training in the first mode. More directly, sport-specificity matters. If you need to get better running, it’s best to run. Need to improve row performance? Row. Clearly, the results here were limited by the small sample size of just 7 athletes and relatively short study time. Moving ahead, we hope to test the transfer of biking to running.